I know nothing about falconry. You can probably choose it as a GCSE at Eton but I went to a school where you were lucky to find a tennis racquet with strings. But I can now add falcons to the long list of things that I've learned from the National Trust. It began when I was reading up on Corfe Castle prior to today's scone mission. "They have a Saxon and Viking falcon display!" I said enthusiastically to the scone sidekick, who was looking at the train times to Dorset and saying "HOW FAR??". "And then next week they have a Norman falcon display, followed by a Medieval falcon display the week after, and then the following week there's a Tudor falcon display, followed the next week by a Civil War falcon display." We looked at each other. I looked back at the website hoping it would continue on to Falcons of the 1960s, where they dress up as Jimi Hendrix and protest against Vietnam, but it stopped in the 1600s. But I'll come back to my education in falcons in a moment. 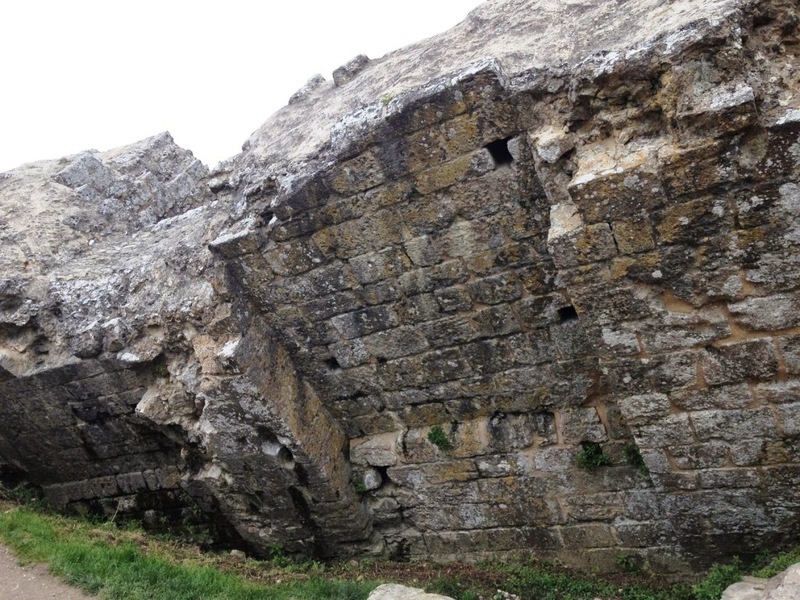 First, let me tell you about Corfe Castle itself. 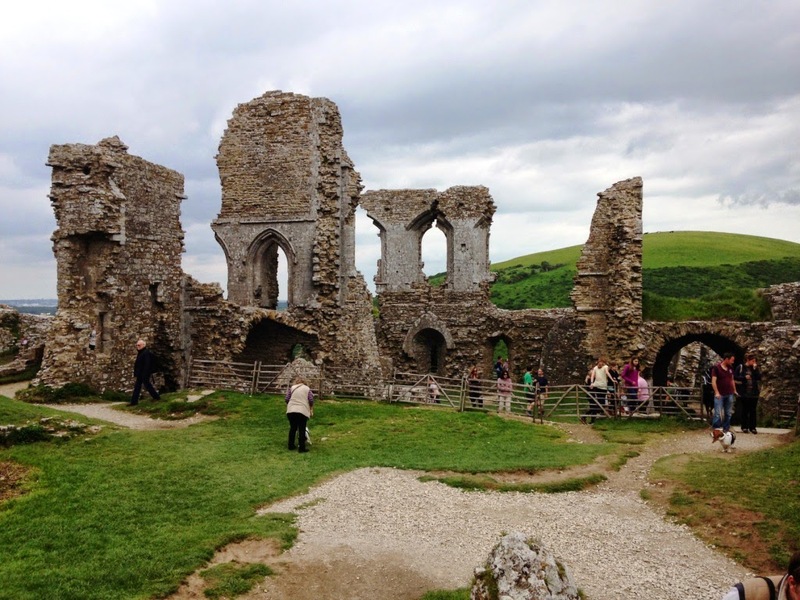 Corfe Castle is a ruin. You probably didn't need me to point that out, but it was demolished by Parliamentarian forces during the Civil War. It was owned by Sir John Bankes and he supported the King. He died, leaving his wife Dame Mary to defend two sieges before someone within the garrison betrayed her and she was forced to leave. She got it back during the Restoration but it had been blown to pieces. It's a big site and you can walk around the various parts of it that were built throughout medieval times - the Norman Old Hall, built by William the Conqueror, is believed to have been built on an older Saxon castle, constructed by King Alfred. It was here that Alfred's son Edward was murdered by his stepmother to put her own son, Ethelred the Unready, on the throne. William's son, Henry I, added a keep and for 500 years the castle was an important royal stronghold. Queen Elizabeth I sold it to her Chancellor, who then sold it to the Bankes family. So what about the falcons? 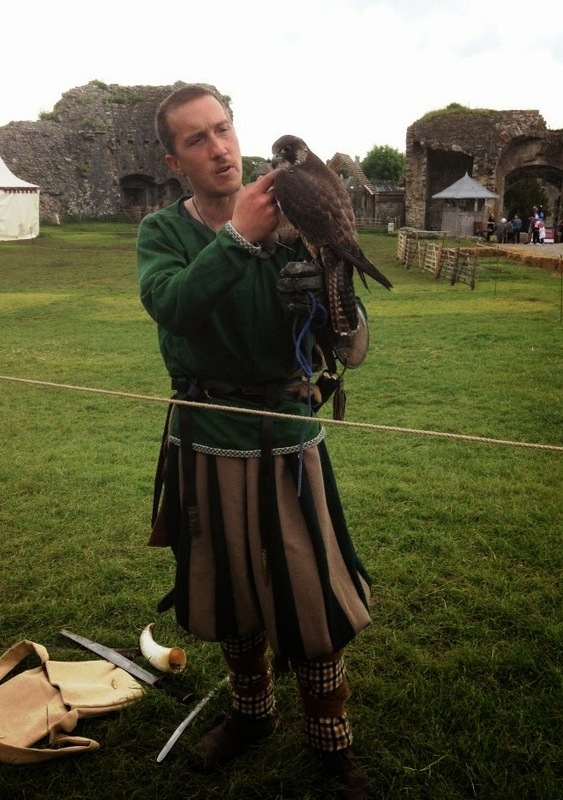 I'll be honest; I'm still not 100% sure about the difference between a Saxon falcon and a Tudor one. However, the man that was showing us the falcons was fascinating. He explained how he trains them using a traditional technique of sleep deprivation rather than withholding food - he really knew his stuff. I don't know if falcons eat scones but I definitely do, so we headed off to find the tea shop. It was a lovely little place and strangely quiet, until I looked outside and realised that everyone else was enjoying their cup of tea in the very large garden that overlooks the castle. 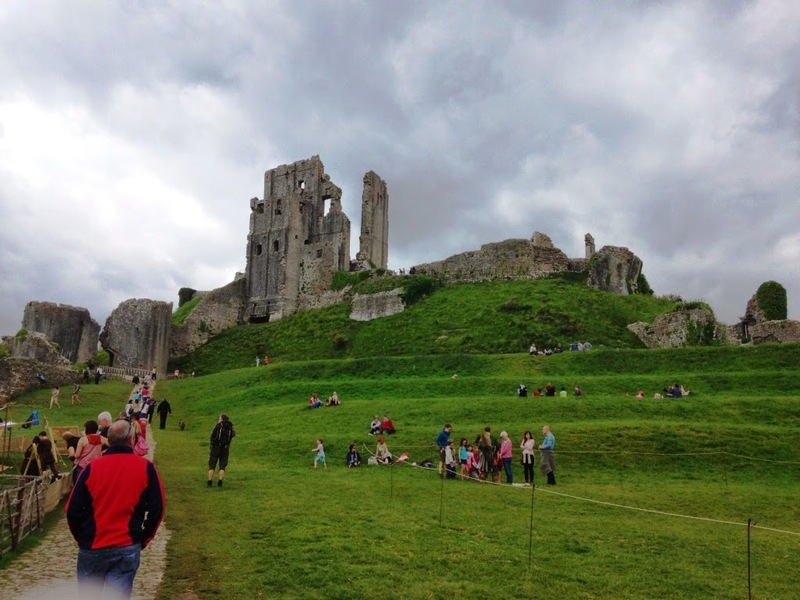 And I found my National-Trust-Guidebook-Fascinating-Factoid-Of-The-Week: the tea room at Corfe Castle sells 23,000 cream teas every year. 23,000. Amazing. 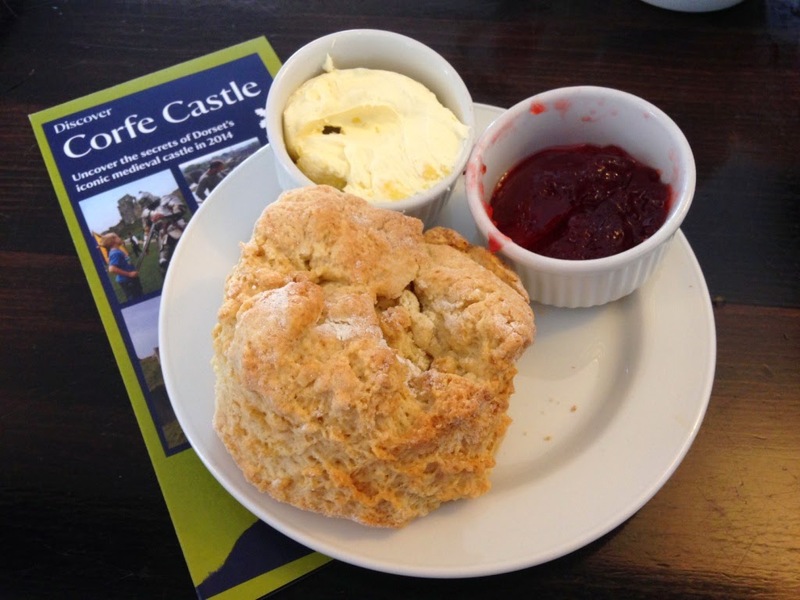 They have an ice cream tea on the menu at Corfe Castle, made with Purbeck clotted cream ice cream. (That's CLOTTED CREAM ICE CREAM for anyone that wasn't paying attention just then.) I was sorely tempted, readers, but I realised that it would ruin this highly scientific study of mine, so I stuck with the standard version. It was delicious. The scone was huge, the cream was thick and surprisingly less sweet than I expected - it was great. Corfe was the 40th destination on my National Trust Scone odyssey and I've come to the conclusion that you can't really go wrong with castles. I loved Bodiam Castle and Scotney Castle as well, so I'll be adding more to my itinerary. Let me know your favourites. I might even take my scone mission international and go to Wales.